The South Asian Games bring more than 4,500 premier athletes from eight nations to compete over a ten day period. In this 12th meeting of the Games, venues were selected in the cities of Guwahati (Assam) and Shillong (Meghalaya), India. To connect the games, athletes, media, and attendees to the world, the organizers needed a robust solution that would be sure to work without incident. 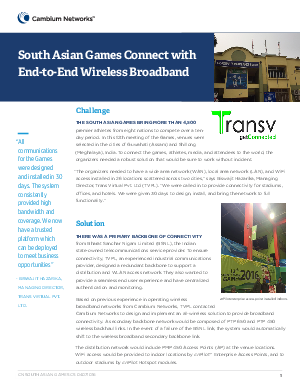 Download this case study to learn how Cambium Networks helped the South Asian Games connect with end-to-end wireless broadband.